Roger Federer knows how to attract a crowd and it was no different on Tuesday. Regarded as one of the greatest tennis players in the history of the sport, the 17-time grand-slam champion was a special guest for FC Basel's Champions League clash at St Jakob-Park. A big fan of Swiss champions Basel, former world number one Federer watched his native club suffered a heart-breaking last-gasp 2-1 defeat to Paris Saint-Germain. 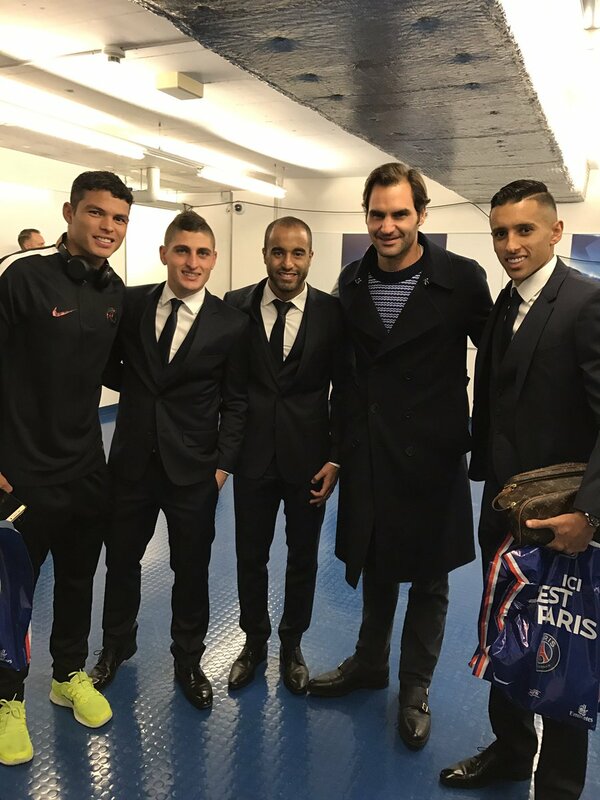 Despite the loss, Federer still found time to surprise the PSG players post-match, pictured with captain Thiago Silva, Marco Verratti, Lucas Moura and Marquinhos. Federer, 35, is working his way back to full fitness, preparing to make a comeback in 2017, having not played since his semi-final loss at Wimbledon in July due to injury.